Home > Baby Helpline > Sick Baby Questions > High Temperature Due To Teething Or Baby Sick? My 7 month old baby had a temperature of up to 39 (102 F) at one point last night coming down to 37. He has had up to two doses of calpol and this morning at 9.00 His temperature is fine at 37.1. Should I visit the doctors as I don’t know if its teething related? Was very unsettled last night!! Can Teething Explain A Fever? So the fever rather indicates that your baby is sick. It can be a cold, a stomach infection or something else on its way. Or it was just one of those mysterious 1 or 3 day fevers that babies can get. Unless you baby continues to be sick and for example stops eating or drinking, I don’t think you have to visit a doctor. Just take care of him and pay attention to his development during the next couple of days. 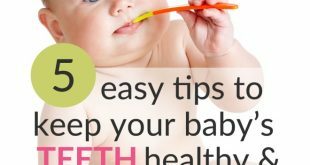 11 month old baby with no teeth – should I worry? My baby is 7 months old and had a fever since yesterday morning, 100 degree F to 101, went up and down. He lost his appetite, didn’t have energy to do anything and was just sleepy. We took him to the doctor. Doctor found throat infection and gave antibiotics, Panamax and nurofen. He was fresh and happy within half n hour after taking medication. We were so relieved but again in the night after 6 hours he got fever. We gave him Panamax again. He slept well. In the early morning, his temperature was high again, gave nurofen. It’s like fever is coming back again n again. Is it normal? How long he has to suffer this? Baby Help Line: Both Panamax and Nurofen are for pain relief and fever reduction. It is normal that babies respond quickly and act as if not ill at all as soon as the fever is down. However, he will continue to get the fever back until the antibiotics have started to take care of the throat infection, probably within a couple of days. When he is up and happy, make sure to offer him liquid and also foods if he likes. (But keeping him hydrated is more important than making him eat if he doesn’t have an appetite.) Good luck! We have changed to a a new commenting system. Add your comments below or return to Sick Baby Q&A.